The 4-star Mercure Hotel Potsdam City is in the historical city center opposite the historical Potsdam City Palace. All 210 rooms are air conditioned and have WIFI. 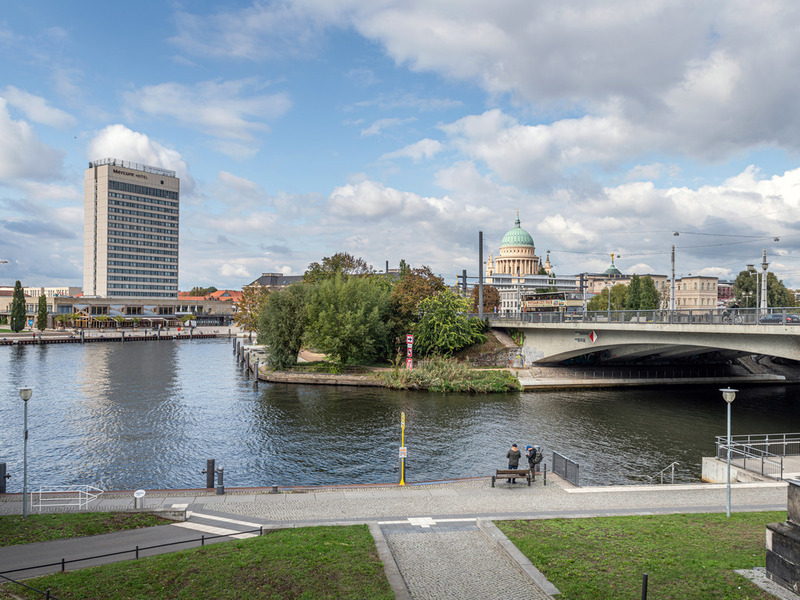 The top floors offer a fantastic view of Potsdam and the lakes. Some of the 13 meeting roo ms are also on the top floors, available for events of up to 200 people. The main train station is a short walk away. If traveling by car, take the A115 highway. The Berlin Tegel and Schönefeld airports are 22 miles (35 km) and 25 miles (40 km) away. Potsdam, the former Prussian royal residence south-west of Berlin, can look back on a fascinating history. Many of the unique buildings and parks in the city are UNESCO World Heritage sites, such as the famous castle and park of Sanssouci. At our 4-star Mercure Hotel Potsdam City, you can choose from Standard or Privilege Rooms or Junior Suites. All 210 rooms and suites are air conditioned and have WIFI. We look forward to welcoming you and your children: One child under the age of 12 can stay in your room free of charge. Your pet is also welcome to stay (surcharge of EUR 10/night). Take advantage of our leisure service: You can book boat trips and hire bikes at reception. Culinary delights await you every day at our restaurant "Oscar" between 6am and 10.30pm. Regional specialties and international dishes are on the menu, and we're happy to serve you on our terrace. Open from 5pm to 1am, our "Cinebar" is a cozy place to meet in the evening. Enjoy a freshly pulled beer or a glass of wine and complement it with some tasty snacks.